Performance gains: The correct break-in of an engine is just as important as its components and assembly. Without taking the necessary steps, the performance and longevity of your engine is severely compromised. Now that you finally have your engine back together and ready for serious street/strip action, it’s very important to follow some basic guidelines to break it in smoothly. This is not always the natural response, however. Many freshly-built motors have been destroyed due to the lack of knowledge on properly firing and running a new engine. 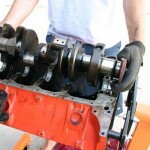 After the engine is mounted back into the frame of the vehicle, add the required amount of oil to the crankcase. In addition, refill the cooling system with clean fluid and water and check for leaks as you go. Be sure all clamps and plugs are securely tightened before starting the engine and pressurizing the systems. Setting the valves is next on the list, and is a must to fire the engine. Once the valves and lifter pre-loads have been set, pressure-lube the engine with a power drill and a priming tool. The shaft of the distributor slips down inside the rear of the intake manifold and engages and drives the oil pump. The priming tool serves as a “dummy” distributor shaft and is rotated by the drill. If possible, have a friend rotate the engine by hand while priming the oil pump to ensure full coverage on the lower rotating assembly. Locating the top dead center position (TDC) of the No. 1 cylinder follows. 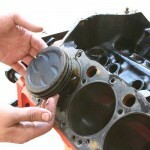 An easy method to determine the piston’s location is to remove the spark plug and cover the hole with the tip of your finger. 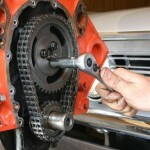 Turn the engine by hand with a crankshaft socket and breaker bar until air pressure is felt at the opening. Continue to turn the crankshaft and align the timing marks on the harmonic balancer and timing tab at “zero.” The No. 1 piston is now at TDC. Install the intake manifold and distributor. With the No. 1 piston in position, mark the distributor housing at the No. 1 terminal. Remove the cap and line up the rotor with your mark. You may need to slightly (and carefully) turn the gears of the oil pump with a long screwdriver to align the teeth of the pump and the distributor shaft. Loosely clamp the distributor housing to the manifold to allow for adjustments later. Install the plug wires to their dedicated terminals on the cap. The carburetor and gasket may now be placed onto and bolted to the manifold. If the bowls of the carburetor are dry, use a small funnel to fill them. When the discharge nozzles squirt fuel down into the venturis, the carburetor is fully primed. 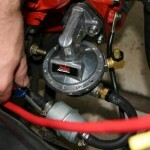 Operate the throttle linkage by hand and check for any binding. Next, turn the idle mixture screws all the way inward (clockwise). Then turn them out (counter-clockwise) 1.5 to 2 full turns. This will prevent a low idle when you first start the engine, and will make sure the fuel flow is sufficient. 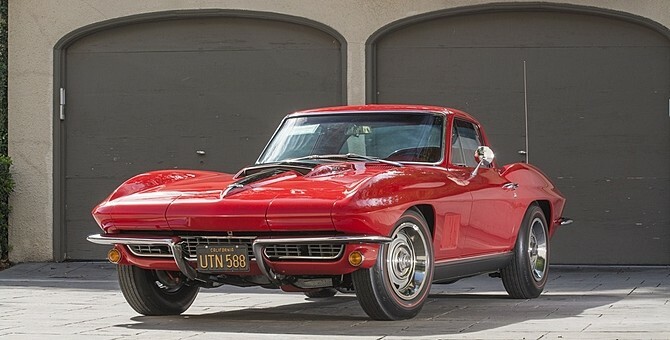 Plug all of the vacuum ports on the carburetor and the intake manifold and disconnect the vacuum advance line from the distributor. With everything reconnected, it’s time to run over the check list. Inspect all fuel, water, and oil lines and their connections. Double-check the firing order of the engine and the supply of 12 volts in the starting system. When you are finally ready to execute the initial firing, have an assistant inside the car with the keys. You will want to be present under the hood to watch for any problems. The engine should fire and run within a few revolutions. Once the motor is running, vary the break-in RPM between 2,000 and 2,500 for about 20-30 minutes to properly run the camshaft in. 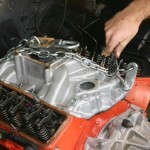 You might need to roughly alter the ignition timing by hand at the distributor housing to find the smoothest operation. It’s important not to let the engine idle during this time. Above-idle engine speeds splash oil on the new cam and provide the necessary lubrication for break-in. Reset the idle speed, idle mixture, and ignition timing for normal operation. Now it’s time to hit the road. Vary your engine speed and load for the first 20-30 miles, avoiding high RPM accelerations. Moderate highway cruising is safe (55-65 mph). The next 500 miles should be driven normally, but without redlining the engine or subjecting it to heavy loads such as climbing steep grades or towing. 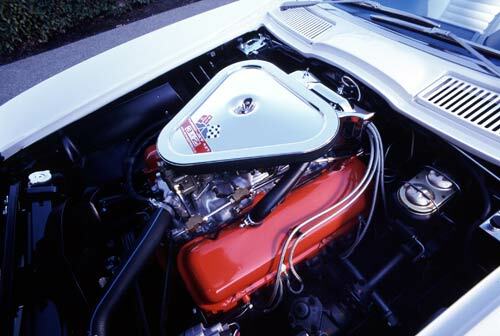 Change the oil and filter prior to and after the 500 mile break-in period to rid any assembly contaminants from the engine.